This article started out as a somewhat cryptic message in my LinkedIn account. All it said was "Read the history and tell us the worth!" with a link to a website. The site consisted of a single Home page, but my gut told me there was an interesting story hiding somewhere. Rather than ignore the note, I decided to message back for some info and ask if the still unknown person might like us to feature a story about a book called "My Old Car". It turned out the person was Dave Lambdin, who went a step further by sending us an email. But it was another message without much content. "Four years of relentless research and fifteen owners later, the Lambdins make a discovery that only one would dream up in a Hollywood film. 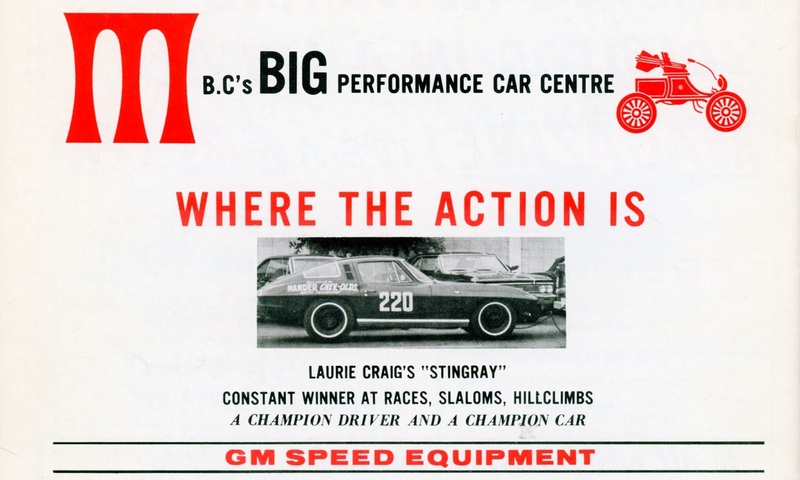 Original owner and 1966 Players Pacific Champion, Laurie Craig, is finally reunited with his winning race car after 50 years." So I wrote back asking for more details if we were to publish an article. The next day I received an email from Stephanie Lambdin, who we then learned was Dave's wife asking what else we needed. I sent her links to a few other articles we had written to help promote various books. Her next email answered all of our questions. To begin with Dave had maintained a 30 year effort searching for just the right car, the right year, color and in respectable condition. Then one day, "out of the blue", there it was. A red 1964 Corvette coupe, well restored, affordable and supposedly with all the records, however the car was located in Anchorage, Alaska, nearly one thousand miles away. Nonetheless, he approached his wife with the idea of buying the car. As you may have guessed by now, she said yes. Dave is a 100% combat-disabled veteran on fixed income. Stephanie is a retired fashion model turned photographer. With two young children and a large home mortgage, money was a main hurdle, but they somehow made it happen. Sight unseen, they purchased the classic car on blind faith. 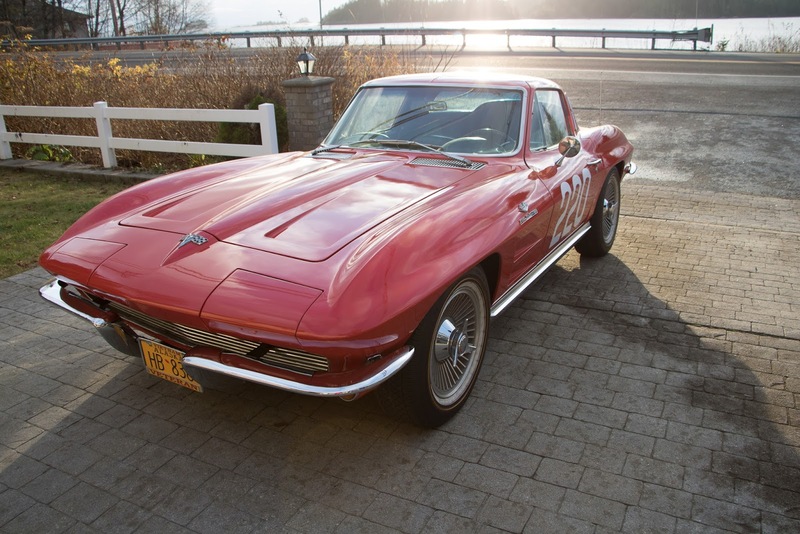 The plan was for the Corvette to be carefully restored to original condition and kept as a family heirloom. The next obstacle was to drive it through a thousand miles of wilderness which takes you over land and sea to bring her to their remote island home in Sitka, Alaska. Stephanie and Dave then begin the hunt to discover if the car was originally equipped with Fuel Injection. This was to prove no easy task. 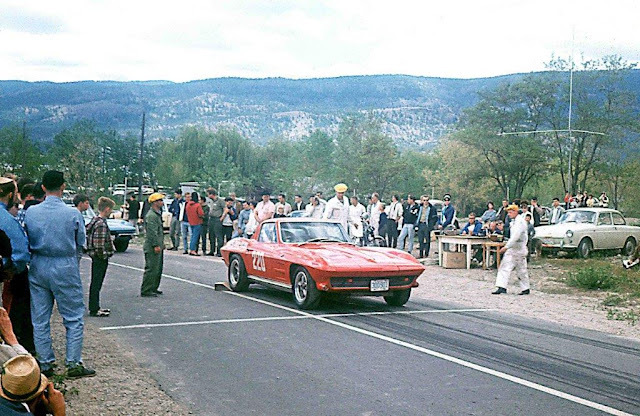 Nearly four years of dogged perseverance brought them into contact with over a dozen past owners of the car, though none of them, except the first, knew the Corvette's race car history. But each successive contact unveiled a treasure trove of detail about their newly acquired Classic. 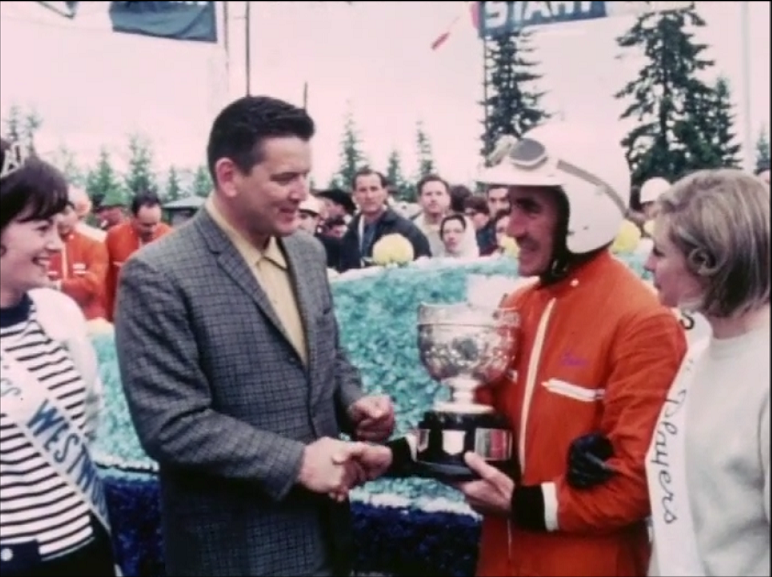 Remarkably, they found the car's first owner, Mr. Laurie Craig, who provided a wealth of information including the car’s racing history, pictures, articles, movies, and exceptional pedigree confirmation. Craig also confirmed our Corvette is exactly the way he boug ht it in 1964 except for tires and rebuilt engine (same year cubic inch and horsepower). 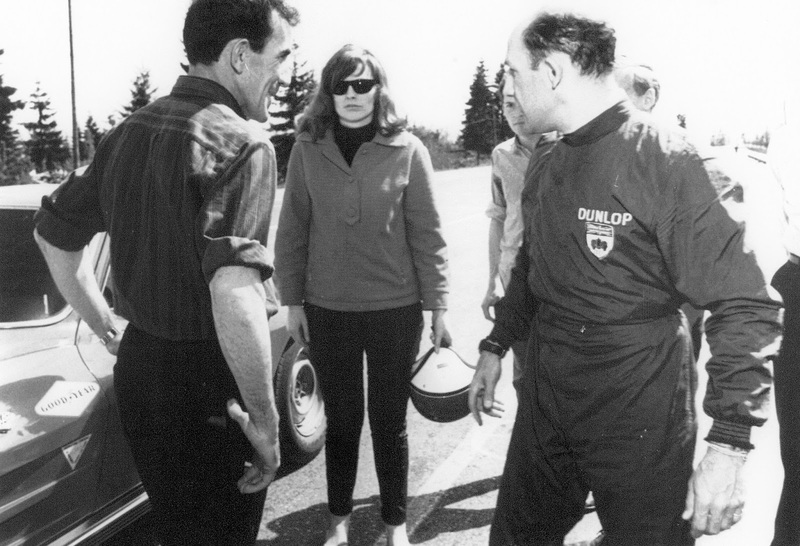 1965 - Laurie Craig and Stirling Moss discussing handling features of Little Red Corvette before Moss takes her around the Westwood Race Circuit for a trial run. The Lambdins make a discovery that only one would dream up in a Hollywood film, so they decided to write a book cataloging the unbelievable details they uncovered. Starting with the original owner Laurie Craig, connections to Craig and the legendary car include Stirling Moss, Carroll Shelby, Bob McLean, Harry Schell, Richard Dean Anderson (Mac Gyver) and others. 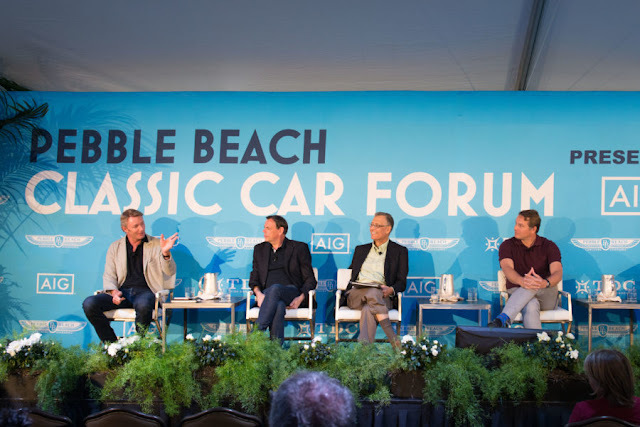 "From the Gran Prix pits of New Zealand to a remote island in Alaska, "My Old Car" tells an amazing tale of adventure and intrigue." P.S.- If you are another blogger following Garagistry, please feel free to repost on your site.